Here is another version of a delightful Dum Aloo. To make this recipe authentically, the baby potatoes need to be deep fried. I took the healthy route and air fried the potatoes. I did not anticipate that the kids would enjoy the air fried potatoes as is. As I was busy with the gravy preparation, the kids and the husband finished off the air fried potatoes with some spicy sauce to the side :). So I had to air fry another batch of potatoes and make this gravy. In a Big Pot, boil water with a teaspoon of salt and slide in the potatoes and let them cook for about 4-5 minutes until they are about 80-90% cooked. Poke each potato with a fork , spray oil and arrange in the Air Fryer basket which has been preheated to 400 °F. Air fry them for about 20-24 minutes until they turn crispy. Set aside. Place the Instant Pot inner pot in place and switch on the power. Set it to 'Saute' mode. Add 1 teaspoon of oil and roast the Red Chilies, Coriander Seeds, Cumin Seeds, Cloves, Cardamom Pod, Cinnamon Stick, Fennel Seeds until they turn aromatic. Then add in ginger, green chilies and tomatoes. Close the lid, Set in the Manual or Pressure Cook mode for 1 minute. Switch off the IP. Transfer into a high power blender and grind into a fine paste. Add oil to the inner pot, wait till 'Hot' and add cumin seeds. After they crackle, transfer the gravy paste and whisk in yogurt, salt, turmeric and Kashmiri Red Chili Powder, dunk in the air fried potatoes in the gravy. Cover the lid and change the mode to 'Manual' and set it for 2 minutes in the 'sealing' mode. Do a quick release and open the lid after the pressure is released and garnish with coriander leaves. Serve with rice/naan/roti and enjoy. kolhapuri dum aloo looks very pleasant with an incredible colour, such a droolworthy, creamy and alluring side dish for rotis. The air fried version of the aloo looks so good Harini. Love that delicious spread.. I can see my family snacking on the crispy air fried potatoes too :-) Air frying the potatoes is such a great idea. I am going to give this delicious curry a try some time soon. Bookmarked!! You are tempting me to buy Air fryer now. :-) Such a delightful potato curry. 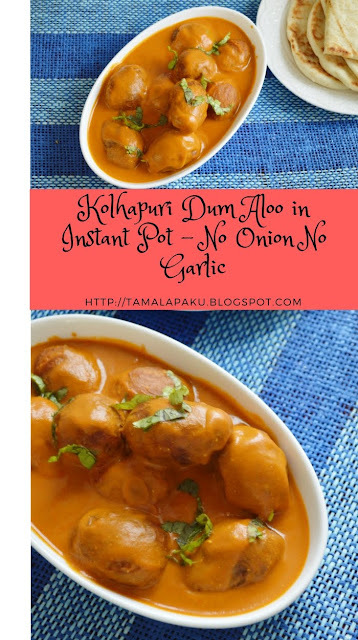 Im a great fan of kohlapuri cuisine and no onion no garlic version sounds interesting!! Awesome..the gravy looks so smooth and so flavorful with all those spices ..I am loving this dish and actually would love to polish it off with those naans in the background. Love that vibrant colored gravy. You have made dum aloo into a healthy version. How good is the air fryer and how has it worked for you so far? Wow seriously must say that with all the dishes you are making in air fryer, I am so tempted too yaar..this is a fantastic dish! I've not tried anything that has been made in an air fryer. Dum aloo gravy looks rich and creamy. A good recipe without onion and garlic. The gravy looks super creamy and like the others have mentioned, you are tempting us to get an air frier! wow kholapuri dum aloo looksso creamy and delicious, You make such yummy versions of curry in Instant pot harini am still learning :) Gravy looks so tempting !! Love the color of gravy for vibrant and tasty.